Irreducibly complexity (IC) is a conceptual test for intelligently designed components or system. It is asserted that if a system cannot be reduced to fewer components and retain functionality, then it could not have evolved by the gradual assemblage of components over successive generations. The concept was popularized by Lehigh University biochemist Michael Behe in his 1996 book Darwin's Black Box. Intelligent design theorists argue that while some systems and organs can be explained by evolution, those that are irreducibly complex must have been assembled by an agent of intelligence. There are many examples of molecular machines, such as the bacterial flagellum, that are composed of numerous elements. Behe rightly points out that such machines are irreducibly complex in that if any one part were removed, the function in question would be instantly lost. How then could such a machine be built up gradually if it will not work to any selectable degree until all its parts are present in their proper order? According to Dembski, the irreducible complexity should be contrasted with cumulative complexity. A system is cumulatively complex if the system components may be arranged sequentially such that a successive removal of components does not lead to a complete loss of function. ↑ Darwin, Charles (1872) Origin of Species 6th ed (1988), p.154, New York University Press, New York. ↑ Behe, Michael J (1996). Darwin´s Black Box:The Biochemical Challenge to Evolution. New York: Touchstone/Simon & Schuster. p. 39-40. ISBN 0-684-83493-6. ↑ Dembski, William (2007). No Free Lunch:Why Specified Complexity Cannot Be Purchased without Intelligence. Rowman & Littlefield Publishers. p. 285. ISBN 0-74255810-X. ↑ Dembski, William A (1999). Intelligent Design:The Bridge Between Science & Theology. Downers Grove, Illinois: IVP Academic. ISBN 0-8308-2314-X. 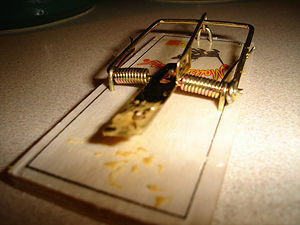 Evolving the Irreducible: Behe's Mousetrap Problem by Sean D. Pitman M.D. This page was last modified on 19 April 2016, at 00:01.